National Trivia Day Contest Stampin’ Up! Style! Hey stampers! I bet you didn't even know that today is National Trivia Day here in the United States. Sheesh, I think there is a “national day” for just about everything! Anyhoo, in honor of this day I'm having a National Trivia Day Contest Stampin' Up! Style! Send me an email (or comment below) by Friday, January 5, with the correct answers to the ten questions below, and I'll send you an assortment of my favorite embellishments from the new 2018 Occasions and Sale-A-Bration catalogs. What charity has been the recipient of Stampin’ Up!’s Making a Difference program since its inception in 2003? Who is the current CEO of Stampin' Up!? What 2 ladies are the founders of Stampin' Up! How are these ladies related? What is the new reward level in Sale-A-Bration 2018? Name one of the 2012-2014 Stampin' Up! In Colors. Stampin' Up! started ____ years ago. Name three current or retired Stampin' Up! colors starting with the letter “T”. Where is the Stampin' Up! Home Office? What is the extra perk of joining Stampin' Up! during Sale-A-Bration? This fun paper is only one of the free items you can choose during Stampin' Up! 's biggest sale of the year; January 3 – March 31, 2018. Check out all of the options below; there's even a new reward level this year! I have several family birthdays coming up so this bold and beautiful card using the Cake Crazy stamp set is just perfect, don't you think? One of the best things about Stampin' Up! is that everything coordinates! The Party Animal Designer Series Paper and Washi Tape work perfectly together on this cheery card. Did you know that you can actually pick these products (or ANY other for that matter) as part of your starter kit for only $99?! That's right, you get to pick $125 worth of products for only $99 plus tax, NO shipping AND you can pick two extra stamps sets of any value…woo hoo! If this might appeal to you check it out here! Instructions, including measurements, for this Cake Crazy card follow below. Just click on any picture to order now…only one more day to grab your free Sale-A-Bration items! Adhere Designer Series Paper onto Whisper White card base with SNAIL. On the smallest Whisper White piece, starting from the bottom, stamp the first cake layer using 3 different stamps and 2 colors (Pacific Point and Crushed Curry). First use Pacific Point and stamp the image with the solid line so the line is about 1/8” from the bottom of the cardstock . Then ink the diamond image with the curvy line in Pacific Point (don’t stamp yet!) and stamp off once then align image over already stamped image and stamp. Ink the diamond image that has no border with Crushed Curry, align over already stamped images and stamp. Stamp “Fantastic” in Tangerine Tango carefully so it almost touches the bottom cake layer and is in the center. Stamp row of stars in Crushed Curry. Stamp next cake layer with top and bottom lines in Pacific Point. Stamp companion piece also in Pacific Point but stamp off once before stamping onto darker cake layer image. Ink top cake layer with Pacific Point and stamp off before stamping. Ink candles with Pacific Point and stamp. Ink candle flame image with Crushed Curry and stamp. Temporarily set that piece over the middle sized Whisper White piece so you know where to next stamp the top and bottom sentiments in Emerald Envy. Once the sentiments are stamped, line right and bottom sides with the Emerald Envy Washi Tape. Using Paper Snips trim Washi Tape. Adhere to card front with SNAIL. Then add two strips of the Crushed Curry stars Washi Tape so it overlaps a tiny bit over the Emerald Envy Washi Tape. Trim with snips. Using Stampin’ Dimensionals, adhere the cake piece to the middle Whisper White piece so it’s centered between the top and bottom sentiments. Sprinkle rhinestones and enamel shapes onto front of card. Thanks for popping in today and I hope you'll have fun making a Cake Crazy card! Oh, if you missed yesterday's post, I showed you how to create a fun custom t-shirt card. Great news…there are new Saleabration choices that just have been added! Sad news… we will soon be saying goodbye to 2015-2017 In Color Mint Macaron…sniff, sniff! This is my favorite In Color from that collection. Of course, all the beautiful colors in that set will be saying adieu as well. BUT…it's not too late to make sure you can continue to make projects like this using YOUR favorite 2015-2017 In Color, whichever one that is! Just click on a pic below to see the product used. Fold Thick Whisper White cardstock in half to form card base. Punch 2” circle from card front. Stamp ‘flourish’ image several times across card front using Mint Macaron ink. Stamp ‘sentiment’ using Smoky Slate ink. Tie ribbon around card front as shown. Center In Color Doily inside punched circle and adhere to inside of card base using Mini Glue Dots. Fussy cut a flower from the Succulent Garden DSP then paint with Wink of Stella – Clear. Add to center of doily with a Dimensional. Add Pearl Basic Jewels to flower center. Splatter card front with Wink of Stella – Gold by tapping handle. If you order right away, you can also still get a free Saleabration product for every $50 purchase…NEW SAB choices have just been added! Hey stampers! Today I wanted to share a video from the Home Office showing you lots of Glimmer Paper projects! With any qualify order of $50 from any of our current catalogs you can get a pack of this yummy paper…for FREE!!! You get four sheets of each color (Mint Macaron, Sweet Sugarplum, and Bermuda Bay) in the 6 x 6 paper stack and the colors coordinate with the Cupcakes and Carousels, Falling in Love, and Succulent Garden Product Suites in our Occasions Catalog. There are so many fun things you can do with this paper and ! I know you'll want to have some of this in your crafting supplies! Just go to my store, pick out at least $50 worth of your favorite Stampin' Up! products and add this item in (item #143831) at the end (if you forget, you will get a prompt telling you to choose a Sale-A-Bration item). Of course, you can choose any free item you'd like! Hey stampers! I wanted to share a simple card today, one made with the Sale-A-Bration free stamp set, Tasty Truck. This has been a popular one with all my customers! Directions, measurements and product links (including new Sale-A-Bration choices) follow at the end of this post. Here's some samples to check out. I LOVE LOVE the glimmer paper. It won't last, so get on over to my online store to place your $50 order and get this 6″ x 6″ glimmer stack for free! Of course, you can place a larger order and get ALL the new items for free AND get hostess dollars to spend, too…woo hoo!! Use thin strips of Whisper White Scrap, stamp the truck using Basic Black Ink…ensuring that the “side bar” is usable. Use aqua painters and ink from lids to color. Hey stampers! I couldn't resist sharing this adorable “Sweet Sugarplum Cheers” card, and give you a sneak peek of another new Sale-A-Bration choice being added by Stampin' Up! later in the month! Sweet Sugarplum is my faaaaaaavorite 2016-2018 In Color and the “Reverse Words” images will complement any card! You'll be able to order this stamp set, 6″ x 6″ Glimmer Paper (in Bermuda Bay, Mint Macaron and…Sweet Sugarplum! ), and the Make a Medallion Stamp Set starting on February 21. Set a reminder in your phone to score your freebies before they're gone! Instructions, measurements, and detailed supply list follows. Why not bookmark this post and then you'll be able to order when the time comes; or, feel free to email me to order and I'll take care of the rest! Ink up Cheers Stamp from Reverse Words in Sweet Sugarplum ink. Stamp Cheers on to white card stock. Adhere white card stock to Sugarplum card stock layer with SNAIL adhesive. Wrap ribbon around the layered pieces and tie a knot. Place 4 Dimensionals on the back, using two of the Dimensionals to secure the ribbon so that it does not slide off. Fold a white note card and crease with the bone folder. Adhere the layered piece with the dimensionals to the note card. Punch out a Bitty Butterfly from the scrap of Sweet Sugarplum. Fold the butterfly down the center. On the rhinestone sheet, cut three rhinestones from the chain of attached rhinestones and adhere to the butterfly. Attach the butterfly to the card with a glue dot. Write a note inside and give this card to a friend to brighten their day! A Village Artiots Kind of Day! Hey Stampers! Village Artiots??? What is going on? Well, let me give you a little peek! One of my dear friends recently moved to Albuquerque. She is a true “artist” and does beautiful handmade cards and mixed media projects. I always love to share projects made by my customers and downline in the hopes they will also inspire you! You can see more from this talented lady, including her “trademark” item, one of a kind, handcrafted, folded paper ornaments here and here. My favorite color is purple and she made me a special one that I display not only during the holidays! One more thing before I let you go. Remember, Sale-A-Bration is in full swing and it's not too late to get free stuff to use in your Valentine's Day projects! Visit my online store to get in on the savings. If your wish list has more than a few items on it, now is also a fabulous time to get the “Big Savings Bundle” AKA Starter Kit PLUS free stamps! $99 for $125 of regular product, 2 free stamp sets of any value in the catalog and you pay no shipping…woo hoo! You might want to take a peek at what that's all about here. I hope you enjoyed our featured artist, Chris Jones of Village Artiots, today! Hey stampers! Today I'll be continuing my tutorial on glass etching, covering how to etch with a rubber stamp. If you missed Part One yesterday, check it out here. So, as many of you are rubber stamping crafters, you need to know how to glass etch using your favorite Stampin' Up! stamps…right?! Let's get started! It definitely is easiest to use a flat, plate for emboss resist etching; it can be done with a round surface but MUCH more difficult and results are often discouraging. So, I'll show you the flat, glass plate method today. Note: Although etched glass is food safe when complete, you might prefer to stamp your image on the back of the plate for a more “finished” look. 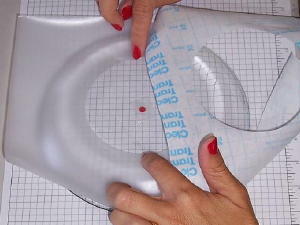 Attach the small, punched circle to the center of the plate with a little piece of tape. This dot will be removed later; it is a guideline for stamp placement and does not have to be in the “exact” center. Clean the back side of the plate thoroughly with glass cleaner or rubbing alcohol. The goal is to remove all the fingerprints and any oil that might be on the surface to be etched. Using a cutter, create a circle “frame” (approx. 8″) from a piece of Contact paper. Affix the frame to the plate (front or back, whichever you choose), using the dot as a centering point. The glass etching cream will be applied inside this framed area, make sure it's pressed down well with no gaps or air bubbles along the edges. 5. Rub the Embossing Buddy across the framed area; this will prevent embossing powder from sticking where you don't want it! 6. Ink your stamp with the Versamark pad and carefully stamp in the center of the framed area using the taped dot as your guide. The glass might be slippery so stamp carefully! If you make a mistake, just repeat steps 5 and 6 again. 7. Sprinkle embossing powder over the stamped image. You can use any color; you will scrape it away at the end of the process. 8. PRIOR TO HEATING, check for any excess embossing powder and remove it with a small paint brush if necessary. 9. Heat the embossing powder with your heat tool until the powder is shiny. This will take some time because glass is much thicker than cardstock. If you aren't sure you've heated it enough, heat a little more just for good measure! Do not hold the plate while heating; the glass gets very hot!! If you make a mistake, just repeat steps 5-9. 10. Pour or dab a large glob of etching cream into the center of the circle frame. Caution: Armour Etching Cream will burn your skin so wear latex or rubber gloves just to be safe. The etching cream also has an odor like rotten eggs, so if that is not a pleasing smell to you (HA!) work outside or in a well ventilated area. 11. Using foam brush, lightly brush the cream onto the frame, coating with a thick layer to ensure good coverage. If you happen to get some outside the frame, wipe it off right away. The cream begins to etch the glass quickly. 12. Set a timer for 5-10 minutes. 13. Once the timer buzzes, rinse the plate thoroughly with warm water, rubbing slightly with a gloved hand. Keep rinsing until no cream remains. Take off the frame and throw away. Take off your gloves and rinse a little bit more just to be sure no cream remains. Use the scraper to get off all the embossing…you can also use your fingernail. 14. Take off the dot and all the tape and dry the plate with a paper towel or a clean cotton towel. NOTE: Etching cannot be reversed. If there was cream in places where it shouldn't have been, it can't be “fixed”. Here are some samples; the possibilities are endless! I hope you've enjoyed and learned something from my tutorials. Give this fun technique a try and share your pictures! If you need any Valentine stamp sets, Stampin' Up! has a lot of new ones; you can see them now at my online store. Remember, it's Sale-A-Bration so any $50 order gets you free merchandise! Oh…if you'd like to get more free tutorials and other stamping related tips, tricks, samples, and more…be sure to put your info in the large coral circle above. We don't flood you with a lot of stuff; we just share our expertise and knowledge with you and hopefully, help you to enjoy your crafting more! Oh my…have you had a chance to order Stampin' Up! 's new Sealed with Love Bundle from the Occasions Catalog? My in person and online clubs this month are doing projects using this sweet bundle! In the first project, my club ladies made a set of six Valentine “tags” that go on a set of wood blocks. Throughout the year, we'll be making other sets, one for spring and a birthday set are the ones already in production. These blocks were a big hit! If you live in the north Dallas, Sachse, Wylie or Murphy area I'd love to start a club with you and your friends! Call or email me and we can see what might work. The card projects are what my online clubs will be doing and it's easy for YOU to join in that fun! Simply place an order of at least $35 at my online store by January 12th using hostess code KZMZ27UU. You will receive a pdf with instructions and measurements to create these two projects. AND, on the 25th of the month, I will mail out, via priority mail, a card kit for each project that will have all the cardstock, embellishments, and die-cut pieces for you to complete the projects. Of course, you'll also receive envelopes for your cards. You are welcome to place any order you like but if you want to use the stamps I used, I'd suggest you order the Sealed with Love Stamp set or bundle that includes the Framelits at a 10% discount. You will stamp your own projects on the cardstock I send in the kits. Other supplies I used are Sending Love Designer Series Paper Stack, Mini Paper Clips, Sending Love Ribbon Combo Pack, Glassine Sheets, Real Red 12 X 12 Cardstock. You can just click on any picture below to go right to my store to place your order. DON'T FORGET that if you place a $50 order, you get to choose a FREE item out of the Sale-A-Bration catalog!…and FREE is fabulous…right?? In case you haven't seen either the Occasions or Sale-A-Bration catalogs, CLICK HERE. Sale-A-Bration is a great time to stock up on stamping basics like cardstock and adhesives, too. If your order totals $150 (before tax and shipping)_ don't use the above hostess code-you'll get to use the hostess dollars and you'll still get the pdf's and card kits. Thanks for popping in today and checking out my Sealed with Love projects. If you have any questions or need help with your order…just give me a shout!